Volker on Mobile Entertainment: O2 gets iPhone in UK - good or bad? O2 gets iPhone in UK - good or bad? "US customer satisfaction is off the charts". These were the words of Steve Jobs on the iPhone, adding he was keen to bring this to UK consumers as well. Now, he would say that, wouldn't he? The lucky (!?) operator to grab it is O2 UK. Why? "We got to pick the carrier that felt most like home, and that's O2", says Mr Jobs. 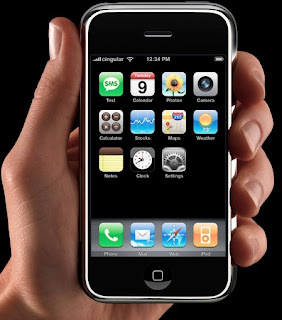 From 9 November 2007 onwards, the iPhone will be available at a cost of 269 pounds which, converted to c. $540, is substantially more than the comparable price in the US (but then, the UK price includes 17.5% VAT, whilst the US price apparently did not include sales tax). From 35 pounds per month (but tied into an 18-month contract), you get an all-you-can-eat data service that also gives you free access to 7,500 Wi-Fi "the Cloud" hotspots in the UK. This is small consolation for the fact that - rather disappointingly - Apple does not offer a 3G version of the iPhone for the European release but is still running on EDGE; O2 is reported to have been working on upgrading its EDGE network in the UK, which is another addition of cost to what already seems to being a costly deal (since you wouldn't normally have to add this to a 3G-capable network). Also, it looks as if it was not unlimited after all: O2 said that "1,400 internet pages per day would break the deal as part of fair usage agreement." Over Wi-Fi, too? Why? The one thing everyone is really curious about is whether those recent speculation that O2 offered a whopping 40% revenue share on airtime (AT&T offered 10% USA). Sadly though, nothing has been confirmed to that end although the 10% seem more likely (and it is in itself a continuation of the small revolution Apple triggered with that deal in the US).